CHICK-FIL-A®: NOURISHING BODIES & SAVING SOULS!!!!! | AMERICAPHILE RESURGENT!!! ← REAL AMERICANS EAT DELICIOUS CHICK-FIL-A® SANDWICHES……. CHICK-FIL-A®: NOURISHING BODIES & SAVING SOULS!!!!! AS REAL AMERICANS GATHERED AT CHICK-FIL-A® LOCATIONS AROUND THE COUNTRY THEY MAY HAVE REALIZED THAT THIS WAS NOT MERELY AN OPPORTUNITY TO SUPPORT A GREAT COMPANY, TO AFFIRM FREE SPEECH, TO DEFEND MARRIAGE AND EAT DELICIOUS SANDWICHES!!!!! UNDOUBTEDLY, MANY WERE MET WITH THE OPPORTUNITY TO WITNESS TO THE LOST!!!!!! WHAT AN EXCITING MOMENT IT MUST HAVE BEEN FOR THE CHICK-FIL-A® CUSTOMERS AT THIS LOCATION WHEN THESE POOR SLAVES OF THE ROMAN POPE ENTERED!!!!!! WE CAN BE CERTAIN THAT THESE WOMEN FINALLY HEARD THE TRUTH!!!!! LET US PRAY THAT THEY WILL REPENT OF THEIR POPERY, GET RAPTURE-READY, BECOME PART OF A MARK 16:18 FELLOWSHIP, COME BACK ON FRIDAY TO EAT SOME MORE DELICIOUS CHICKEN, AND FINALLY ENJOY LIVES WITH MEANING!!!!!!! CHICK-FIL-A® SHOULD TEAM UP WITH CHICK PUBLICATIONS TO DISTRIBUTE INFORMATIVE LITERATURE ALONG WITH DELICIOUS CHICKEN SANDWICHES!!!!! CHICK & CHICK!!!!! WHAT A WINNING TEAM!!!!! 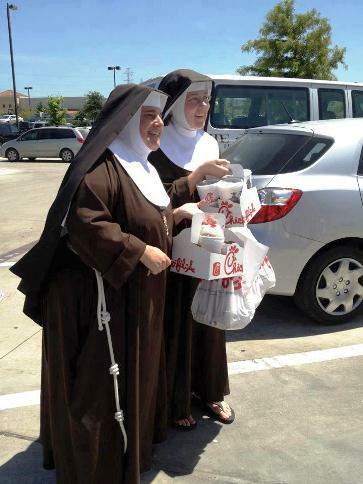 THESE LOST NUNS SEEM TO ENJOY IT…. AND THEY’RE PROBABLY HEARING THE WORD FOR THE FIRST TIME IN THEIR LIVES AND LEARNING THAT THE ROMAN POPE IS AN AGENT OF PIAPS!!!!!! Pingback: ANTI- CHICK-FIL-A® TERRORISTS PLEADS GUILTY!!!!!!! « AMERICAPHILE RESURGENT!! !